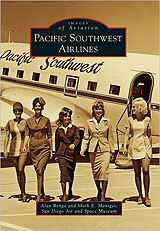 Turbula - Culture - Book review: "Pacific Southwest Airlines"
Hawaii and Alaska have their namesake airlines, and Hawaii also had Aloha Airlines for a good run. But San Diego may be the only city that was associated with an airline. A new book from Arcadia Publishing, and written by two staff members from the San Diego Air & Space Museum in Balboa Park, will remind locals of how much the long-gone Pacific Southwest Airlines personified Southern California in the 1960s and '70s. Largely a photo history drawing on the museum's extensive archive, "Pacific Southwest Airlines" reminds us of how influential the regional airline was. A trend-setter in both business practices and pop culture, PSA's influence was felt far from its relatively small service area. Photo after photo makes two points very well: The smiley faces painted on the front of all the PSA jets remain a potent symbol of a very smart corporate branding effort, and no airline contributed more to the stereotype of stewardesses in that era. In fact, it was PSA that was first to dress its female flight attendants in miniskirts, the first to adopt hot pants as a uniform item, the first to issue go-go boots. Looking at some of the vintage photographs in the book will leave you wondering if you're reading a history book or looking at outtakes from a lost "Austin Powers" movie. The book begins with the roots of PSA as a flight school founded after World War II to provide civilian flight instruction to former military pilots hoping to get jobs in the booming post-war airline industry. From small prop jobs up through the latest jetliners of the 1970s and early '80s, the history of PSA is also the history of the modern airline. The accompanying text does a nice job of providing context to the photos. For instance, the section on the crash of Flight 182 in September 1978 not only provides information on each photograph, but also explains how the crash spurred safety improvements throughout the industry. The story, of course, ends with PSA being bought by USAir in 1988. But the book also points out how PSA's innovations live on, if not its sexist approach to flight attendants. Today, the very successful Southwest Airlines continues to employ many of PSA's business practices, with a particular emphasis on friendly service that Southwest's founders openly adopted from PSA when they began Southwest as a regional Texas airline in the late 1960s. A large company that is remembered for its friendliness? There's a reason San Diegans still take pride in their association with PSA.